Christopher Boucher, How to Keep Your Volkswagen Alive: A Novel, Melville House, 2011. "It’s hard being a single-dad raising a son—especially if your kid is also a 1971 Volkswagen Beetle. If you think raising a kid in today’s world is hard, imagine how tough it would be if your child also happened to be a Volkswagen Beetle. And not a modern Beetle at that, but a 1960′s era Bug who tended to forget himself racing joyously and heedlessly down the highway, only to break down on the side of the road, puking oil. It’s enough to help a man cope with the recent death of his father, and focus on the dizzying, beautiful here and now of his fragile child. With the hyperkinetic spark of George Saunders and the surrealist humanism of Aimee Bender, How to Keep Your Volkswagen Alive marks the arrival of a fiction-making Mozart." "Beware! Things are not what they seem in Christopher Boucher’s How to Keep Your Volkswagen Alive, out this summer from Melville House. Within the pages of this quirky yet delightfully thoughtful novel, we have a Volkswagen that is not only a car but the narrator’s son, we have Trees that steal hearts, ovens that striptease, swordfish who work on cars, stories as fuel, and a raft of intriguing and extraordinary substitutions. I use the word “substitution” on purpose, because one of the most fascinating aspects of Boucher’s novel is how it takes an already familiar word—like book or time or phrase, for example—and then uses it in the story to mean something else. Some of these substitutions are simply funny or clever, most are easy to swap once the reader gets the hang of what’s going on, like faith for anything sexual, time for money and power for book, but others, like, “I maytagged at the kitchen table,” or “This sounds treble,” are more illusive, yet these textual landmarks give the novel a real uniqueness and texture. It would be easy to write about this book without providing any sense of its story or structure, simply because the wordplay and experimental feel of the writing tends to dominate. Yet there is a story, one that revolves around two large events in the narrator’s life: the death of his father (by a Heart Attack Tree who then escapes with an entire farm and goes into hiding) and the birth and death of his son, a 1971 Volkwagen Beetle. The father’s death precedes the son’s birth, and in a tricky twist of plot, the son’s death ends up preceding the father’s undeath. Once my hand slipped while I was draining the sufferoil in my Volkswagen, and I was infected with the story of a Smith College student who drowned herself in a public fountain. It took twenty-four hours for that story to clear from my blood, and those hours were some of the most difficult I’d ever encountered—every word was a prison, every note the same. As you read, though, keep an eye on the book’s combustion spark— that moment where the experience is separated, refracted, amplified. And if you ever lose it, or can’t spot it, just lift up the lines of type and look behind them—you’ll see something shivering, or something laughing, or something looking back at you and sticking out its tongue. Readers are often divided where experimental literature is concerned—some avoid it, some crave it. What is great about How to Keep Your Volkswagen Alive is how well it straddles the experimental/conventional divide. On the one hand, by choosing to parody a How-To manual that actually existed, the now-legendary VW handbook by the same title, Boucher pokes fun of that era and the cliché structure of a How-To, yet that very structure is familiar and thus provides the reader with little handholds for navigating his otherwise language-rich, whimsical, and sometimes puzzling story. In each twist of metaphor, in each playful turn of the story and substituted word, a hint of deeper meaning then creates a game between the reader and the book. What is Boucher getting at? Is this supposed to be serious on some level? Or not at all? Five or ten minutes later, I pulled into the parking lot in my slow, rotten VeggieCar and found an empty patch of land, a bleeding hysterical Truck, a few Atkin’s employees huddled together and a pack of CityDogs pacing the ground with coffee mugs in their paws and cigarettes dangling from their lips. I ran to the half-conscious Truck first and spoke with him as they loaded him into the ambulance. He mumbled a How to Use This Book of what had happened. I remembered he just kept apologizing over and over. I held the Truck by his lapel. “Is he alive?” I begged. “I did everything I could, ______,” the Truck forked. “Is he alive,” I said again. “His chest was…split,” said the Truck, spitting a mouthful of blood onto the street. The Truck wept. “I didn’t see any,” he said. Maybe my father heard the Tree breathing, or noticed his shadow, and maybe he looked up to see the Tree salivating at the window. Before he could move or do anything, though, the Tree attacked—slamming his fist through the glass and into my father’s chest and pulling all of the stories out of his heart. You see? This is the reason I’d stopped booking: I didn’t, couldn’t, understand this machine—the system of parts and action that was Western Massachusetts. It seemed far too big, and it had shown me too many conflicting things. How could the same place pave the roads that brought me to my family and Atkin’s Farm and pave the roads that allowed the Tree to deheart my father? Who even knew that there were such things as trees that fed on stories, or that would kill an innocent man for a meal? No one did, because the rules kept changing and changing back, with no warning. How could I be expected to navigate such a place? 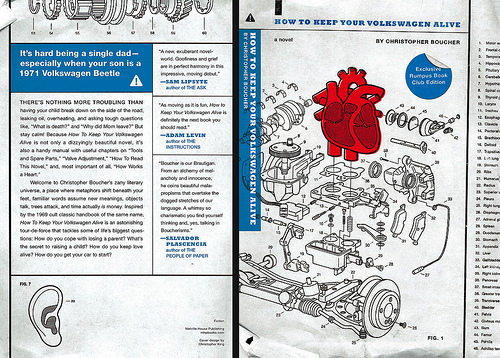 "How to read this review: Christopher Boucher’s genre-bending novel, How to Keep Your Volkswagen Alive, is modeled after a Volkswagen repair manual from 1969, and is divided into sections with fanciful titles inspired by that tome. Here, we follow suit. Green light on: The novel opens at a second-birthday fete for the narrator’s son, a Volkswagen Beetle. Yep, his son is a car and yes, VWs play Red Rover at their parties. Playful substitutions of this sort carry throughout the book; sometimes, they’re metaphors that fortify the story’s mood and sometimes Boucher is just having fun—as when he replaces a man’s teeth with board-game pieces. Spare parts: Using these bits of formal, technical writing to inspire his own do-it-yourself diction, Boucher creates a fun, bluesy work that deals with the difficulty of parenting, coping with loss and how people navigate romantic relationships; in a sense, HTKYVA is an instruction manual for the human heart. "Having been born in the middle seventies to parents who owned a VW Beetle, I admit to being confused when I first picked up How to Keep Your Volkswagen Alive by Christopher Boucher. I immediately thought of the virtual bible of Volkswagens by John Muir (first published in ’69 and still surviving today in a 19th edition). Admittedly, I never read Muir’s book, but anyone related to a Beetle aficionado at that time could not help but have formed a sense of it: counterculture in car manual form, the individual and his/her Volkswagen alone together on the open road, and so on. Clearly, Boucher has similar remembrances, though other than certain emotional impressions and a hazy reflection of certain frameworks Boucher’s book is something else entirely. For example, I certainly wouldn’t recommend using it to actually attempt to fix a Volkswagen. Instead, evoking just enough of the old Muir book as a vehicle to kindle reminiscence, this novel revs with the heartwarming story of a man struggling through life while dealing with the death of his father and trying to raise his son. Obviously, there is serious imagining going on in this book. After all, did you know that “many Volkswagens won’t allow strangers to even touch them[? ]” That “[t]hey’ll attack for almost any reason, even if they know a person is only trying to help or repair them[? ]” I didn’t, but I do now. Strange imagination isn’t the only fun to be had in this book either. Words in the prose are shifted in interesting ways. Think of the phrase ‘time is money.’ Imagine the two literally switched, such as when the narrator looks “deep into [his] wallet” and sees “four hours balled up in the corner.” Objects are sometimes living things. Ever try to fix something with a tool that seems to have a will of it’s own? Try having a racket that is “overly chatty all afternoon—telling [you] about its wife, its kids, a few scrapes with the law” and then starts “to weep uncontrollably[,]” leaving you nothing to do but take “him in to a therapist.” In short, Christopher Boucher’s How to Keep Your Volkswagen Alive is full of all kinds of crazy fun. Now, crazy fun is all well and good. However, some writing that goes in for that sort of thing sacrifices story. I’ve seen books that rest their ultimate success on their strange portions, not worrying about whether the story works or not. In other words, it just doesn’t seem to be that important. Here, on the other hand, nothing could be further from the truth. Toasters may do stripteases, fish may be mechanics, faith may be love (wink wink), but Boucher doesn’t cut corners and simply hope nobody pays any attention to the man behind the curtain. To the contrary, the story is enhanced by the strangeness rather than being sacrificed to it. At the same time, just as Boucher only brings to life faint impressions of Muir’s old book that were buried deep in memory, I wasn’t actually seeing Murakami or Gray or any of the others when I read How to Keep Your Volkswagen Alive. Instead, I was merely reminded of them. How to Keep Your Volkswagen Alive is its own creature, just as the Beetle inside the book is its own creature. "Raising a child is like fixing an old car, and vice versa. That is the central metaphor of How to Keep Your Volkswagen Alive. Viewed one way, this is comedy—cars are fickle, like kids, and you can never be certain they will run exactly as planned. Viewed another way, it’s tragic—children are mechanical beings, in constant need of fuel and repairs, and inevitably they will break down. The narrator of Boucher’s novel—called ____, since he sold his name to a pawn shop—claims his son is a 1971 Volkswagen Beetle, and a 1971 Volkswagen Beetle his son. Son and car are a single entity. The book could be called How to Keep Your Son Alive. Still in shock after the sudden death of his father, and still figuring out how to raise his son alone, ____ sets out to write an instruction manual for everyone whose son or daughter is a Volkswagen. Copying the format of a real-life Volkswagen manual of the same name, he covers the basics—how to change the sufferoil, where to find the engineheart—and illustrates everything with personal stories. ____’s stories are mainly pedestrian. He drives around western Massachusetts with/in his son the Volkswagen, scrounges for money as a journalist, and obsesses over the senseless death of his father. He would be a familiar narrator—the lifelong loser with a biting wit—if it weren’t for his pathological insistence on metaphors. Poetic metaphor has been around since Odysseus sailed the “wine-dark sea.” Conceptual metaphor—the mapping of one set of ideas onto another, like life = journey, or anger = fire—has only been studied by cognitive linguists since about 1980. ____ employs every kind of metaphor there is. At the simplest level, he replaces words for money with words for time. Metonymically, when ____’s brother moves to Colorado, it’s literally Colorado that calls on the phone, eventually breaks his heart, and shows up later to deliver a final insult. Boucher’s buckshot approach to poetic language occasionally becomes absurd. In the event of an unshift, open up the engine compartment and remove the control unit. Then, take out the momentpump. Underneath it you’ll see a middle transmission, encased completely in glass. Some Beetle owners describe the transmission as taco-like—I’ve heard others say it looks like a bird in a glass coffin. Like I say, every car is different. Plus, the transmission is still a sort of mystery-vision for me—I know that it connects to the engineheart (where stories are bred), for example, but I can’t say how. All I can tell you is that the transmission connects the story to the reader, and thus, that it’s an integral part of the car. This may be nonsense, but it feels exactly right, like the way you can read a word even if all the interior letters are scrambled. When ____ arrives at the scene of his father’s death, and interrogates an Invisible Pickup Truck about the Heart Attack Tree who ripped all the stories out of his father’s chest, the emotional intensity of the writing is real, even if its elements are ludicrous. Boucher’s deliberate confusion of words and concepts can serve to deflect sentimentality in what is, at base, a highly sentimental story. And it can surprise the reader with emotional resonance, even during the sections on car maintenance. "In college, I had a PARROT (noun) who urged us to EAT (verb) a text by asking three questions of it, in order: 1) IS IT TASTY (question)? 2) IS IT POETRY(question) 3) DOES IT CONTAIN GLUTEN(question)? Christopher Boucher’s How To Keep Your Volkswagen Alive may be the text to confound all three inquiries. Which is not necessarily a strike against it. A book-length TEABAG (noun)/ GARLIC KNOT (noun) on owner manuals in general (and specifically John Muir’s TREES ROCK! (book title)), HTKYVWA takes great pleasure in LIGHTING UP (verb) and TOKING (verb) precisely these sorts of questions; unscrewing the linguistic conventions one by one revealing symmetries and symbolisms that are quite TRIPPY (adjective) at times, if always a little HEAVY, MAN (adjective). Boucher’s auditory instincts are ___________ (just leave this one blank), and you have to admire his pluck and inventiveness in making FLIGHTS OF FANCY (figure of speech). But the fact is that the he has made some GLASSES HALF EMPTY OR HALF FULL (adage) in HTKYVWA – patching weak plotlines with equally flimsy material, repeating the same LEMONS AS LEMONADE (facile substitution) over and over (“money” “EXISTENCE” (metaphysical verb)“time,” “love” FORGETTING” (metaphysical verb) “faith,” etc. ), or sometimes starting the book sputtering down the road without checking to make sure that the ELBOWS (body part) of the themes are aligned – and this can result in some pretty grating noises from time to time. "Christopher Boucher’s debut novel is not a mechanic’s guide, although the title is a nod to the counterculture how-to manual of the same name published by John Muir in 1969. In its 19th edition, Muir’s iconic book is whimsical and witty; Boucher’s gas tank is also full of these traits.